Plus, as much as I want to pull my hair out sometimes, I would miss that bedtime story with my kids, and that last snuggle and feeding with my baby. They’re only little for a short while, and as crazy as that short while gets, I don’t want to miss any part of it. There will be time later when they are all in school for me to do more of that stuff. So for now, we get to be creative in the money department. WASTE NOT, WANT NOT! 1. Cook more from scratch. It’s healthier, and if kept simple will be even cheaper than clipping tons of coupons and driving my kids all over town to get those great deals on convenience food. With all the wonderful tools we have online for finding great recipes, this one is a piece of cake! In fact, I’ve done part of the work for you in a post I wrote over at Double the Batch call 15 Frugal meals for a small Budget! 2. Plan meals around what’s on sale. When you get those annoying grocery store ads every week, take a look at what’s for sale (pay closest attention to the front page as those are usually the best deals) and then plan your meals around those items. There are plenty of awesome apps out there to help you plan your shopping trip and organize your frugal recipes. I have used plenty but my favorite is Paprika. It’s not a free app but, in the long run, it has given me the best for my buck. 3. Use half. Most things we use, can be cut in half with the same end result. Use half the shampoo, half the body wash, fill the tub half as full, etc. I usually use half the recommended laundry soap. My clothes get just as clean and my washing mashing doesn’t get as much build up too! Some things aren’t realistic to half, though, like baby wipes, or…chocolate! I do use coupons if they match up to what we already use and need, but once upon a time I was a die-hard couponer and learned the hard way that dragging my children out several times every week to get coupon deals was not worth it. I don’t even remember that year of my kids life because I was so focused all the time on all the great coupons and deals I was getting and my family’s health declined severely that year for all the packaged crap we ate. Not going down that road again! 6. Purchase higher quality items. This is not the case for everything, but I have found that sometimes I save more money in the long run if I purchase higher quality rather than cheap items that fall apart easier or are harder to maintain. Take for example an entertainment center. When we were first married we found a brand new entertainment center at our local superstore for only $50! Of course we thought new is always better than old so we purchased it! Within a year, the doors, wouldn’t shut and were coming off the hinges, and it just didn’t look ver nice at all. Had we either saved up longer or bought a used yet higher quality entertainment center, we would not have had this same problem. Get it? 7. Get cash back whenever possible! When I do need to shop for something online, I always try to remember to activate my EBATES so that I get cash back for my purchases. After all, every penny counts, right? I made sure to install the Ebates button on my search bar so that it would automatically remind me when I went on a site that was eligible for cash back. My “mommy brain” just wouldn’t remember otherwise! Another great thing I use is Amazon mom. Who can say no to name brand diapers at the generic price delivered to my door with free shipping! Amazon will even let you have a free trial to see if you like it before you commit. We share our amazon prime account with 2 other family members and split the yearly subscription. It ends up only being like $33 a year which is awesome! 8. Lead by example. I grew up in a family of eight and money was always tight! I don’t remember being miserable or unhappy, though, because my parents always found ways to provide us with what was most important. Think of all the wonderful things you can teach your children about the simple things in life! The more ‘stuff’ my kids get, the more ungrateful they are and the less they appreciate what they have. Life doesn’t always have to resemble the “happiest place on earth.” Be happy, be grateful and teach your family to love life, come what may! 9. Share with others! 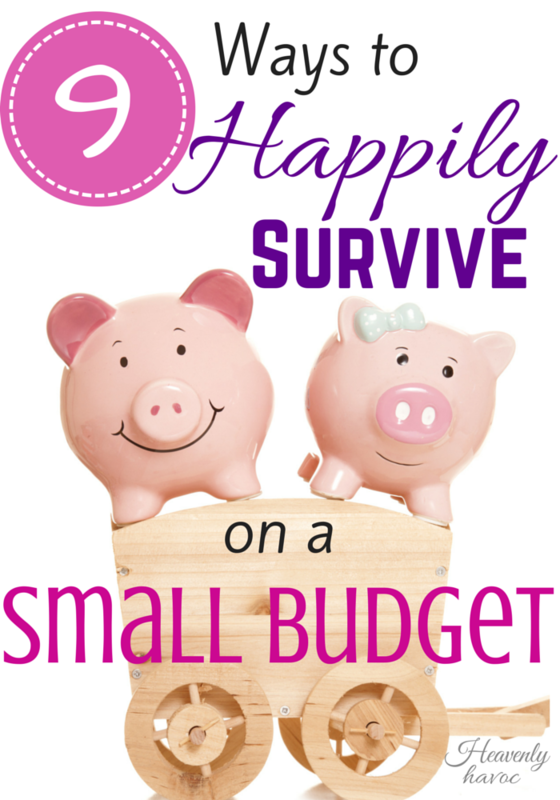 With a tight budget, it can sometimes be easy to hold on to everything you possibly can. Sharing what you have with others in need only brings tremendous blessings into your life. I have found that the more I give, the more I receive in return. Sometimes it comes in the way of financial blessing and sometimes it comes in other forms, but it COMES! Beware the temptation to be selfish. There is a difference between being frugal and being a tightwad. The difference is one does their best to live within their income, yet also help those around them whenever possible. The other refuses to spend an extra penny on ANYTHING or ANYONE. Choose to give! Most of all, I try to remind myself when we can’t take our family on that dream vacation or we don’t live in the newest or nicest home, or have a home that’s perfectly decorated with new plush furniture, that we’re giving our children what’s most important, our time and love. 20 years down the road, that will matter more than what kind of ‘stuff’ we owned. And as long as chocolate still exists and I own a library card and a TV, we will survive! !